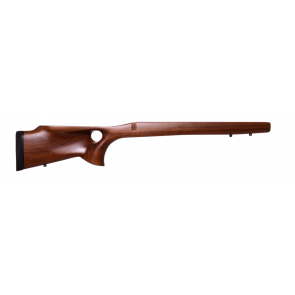 This is Stocky's® more traditional sporter style thumbhole stock that is right at home in the woods or on the range. 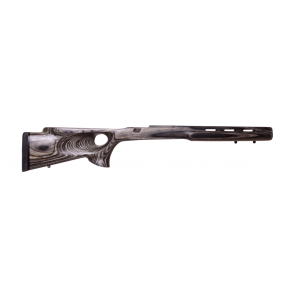 Features include a comfortable rollover cheek piece and a semi-flat forend for greater stability when shooting from a rest while retaining a comfortable grip for offhand and field position shooting. This exciting gunstock is a completely finished drop-in and will have you shooting one of the world's best thumbholes shortly after you open the box. 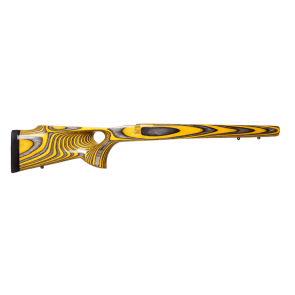 It comes with a durable, ding-resistant, non-reflective, no-spook, waterproof finish, dual forend studs (sling and 'pod) and a thick vented AireCoil or Decelerator recoil pad. Dare to compare ... the rich, dark, uniform coloring, premium machining and finishing combine to produce the most striking and functional laminated riflestock in the price range today. The LRV is a tremendous value in premium quality laminated riflestocks. This is the one to choose if you want the best for your heavy barrel unit. 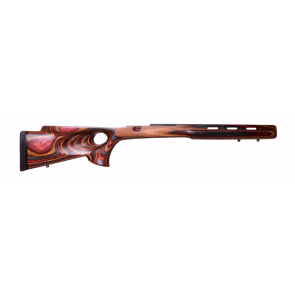 Includes Fitted Pachmayr Decelerator Recoil Pad and swivel studs.